Many members of the LeConte family spent their lives in search of scientific discovery. Believe it or not, two mountains, a fish and a flower all have something in common - the LeConte name! Mount LeConte is located in the Great Smoky Mountains National Park in Tennessee. If you measure it's height from the base to its highest peak it is the tallest mountain in the Eastern United States. It is made up of sandstone, siltstone, shale and conglomerate formed over 450-800 million years ago. There is controversy as to whether the mountain was named for Joseph LeConte or for Joseph's brother, John. Read about hiking Mount LeConte and view more pictures. Another Mount LeConte is located in the Sierra Nevada mountain range in California. The mountain was named for Joseph LeConte in 1895. It is located near Sequoia National Park and the John Muir Wilderness and lies approximately 3.5 miles southeast of Mount Whitney. Joseph LeConte visited the Sierra on numerous occasions, often with members of his family. Read more about Joseph's historical connection to the Sierras, the LeConte Divide, LeConte Falls and the LeConte Memorial Lodge. Read a portion of Joseph LeConte's journal describing his excursions in the high Sierras. The Hymenocallis Coronaria LeConte or Shoals Spider-lily is an aquatic, perennial flowering plant native to the Southeastern United States and found only in Alabama, Georgia and South Carolina. William Bartram was the first to scientifically describe it in 1793. 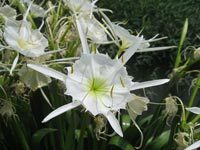 Within Alabama it is known as the Cahaba Lily but outside of that state it is called the Shoals Spider-lily because it requires swift, shallow water current and direct sunlight to flourish. It grows to be about 3 feet tall and develops from a bulb that lodges between rocks in the shoals. It blooms from early May to late June and each flower blooms for only one day. The LeConte's Loach is a freshwater fish found mainly in rapid-moving streams in Europe, Asia and Morocco. They are nocturnal and prefer to be in the company of others of their species. Loaches are mostly scavengers and eat crustaceans, insects and other small invertebrates. They are a popular food fish in East Asian countries such as Japan. Some are also caught and used for bait. They are also a popular aquarium fish in South and South-East Asia. In addition to what has already been mentioned, there are two bird species; three turtles; a mountain in the Sierras; a lake; a waterfall; a divide; a dome; a glacier in Alaska; two species of plants; three fossils; a pear tree; a mouse; a school; three university buildings and three avenues that carry the LeConte name.